Nexus 10 is the powerful 10-inch tablet from Google. With a dazzling 2560-by-1600 (300ppi) display and ultra-powerful graphics processor, Nexus 10 places you right inside the action with picture-perfect performance. Over 4-million pixels in your hands means that text is sharper, HD movies are more vivid and photos come to life in stunning detail. However, the same other tablets, DVD is not supported by the Nexus tablet. To get the movies off DVD onto Nexus 10 or Nexus 7, first you need to convert DVD to Nexus tablet friendly format like MP4. To rip DVD movies to Google Nexus 10/Nexus 7, here EaseFab DVD to video converter is highly recommended. It's an intuitive DVD converter that allows you to easily convert DVD to Nexus 10 MP4 so that you can enjoy any DVD movies on your Nexus 10 on the go. Besides, it has ouputs with optimized settings for Nexus 7, Nexus 4, etc. Google Nexus series. 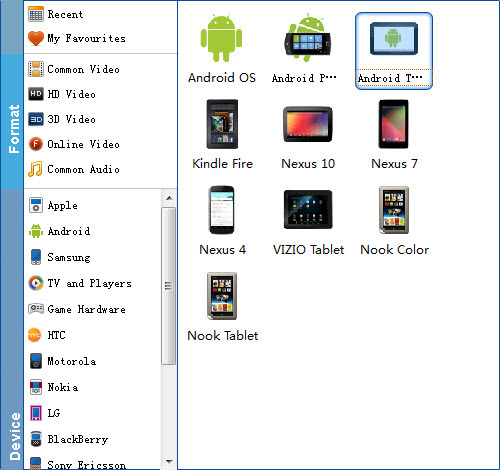 With a few clicks, you can copy your favorite DVD movies to Nexus 10 for enjoyment anywhere anytime. You can also use it to convert DVD to play on iPhone, iPad, iPod and more. Up to 250+ output format supported. Now download it and follow the tips below to finish your task. Open the DVD Ripper and click on the upper "Load DVD" button to load the DVD movies you want to play on your Nexus tablet. All added files will be listed on the left source area. You can preview the DVD videos on the right viewing window and take snapshots of your favorite movie scenes. After all necessary settings, simply click the big Convert button to start converting the added DVD files to Nexus 7 or Nexus 10 compatible videos. Wait for the conversion to complete and click Open Folder to get the converted videos instantly. After that, transfer them to your Nexus 7/Nexus 10 tablet and watch them anywhere you go. Just enjoy your movies!